SP SETIA Bhd, the country's biggest property developer, is on track to meet its sales target of RM1.1 billion by October 31, thanks to its innovative home loan scheme. Dubbed "Setia 5/95 Home Loan Package", it allows buyers to make a 5 per cent downpayment on a house and nothing more until completion. The scheme was launched on January 19, and due to its overwhelming response, the company has extended the promotion period to July 19 and is targeting an additional RM300 million in sales, group managing director and chief executive officer Tan Sri Liew Kee Sin said. Up to April 19, SP Setia has registered RM500 million in sales. SP Setia is launching Setia Sky Residences this month, expecting to rake in RM200 million sales. "When we launch, one whole block comprising 211 units will be sold. Times are good for developers," Liew said at the launch of the group's first low-cost housing scheme at its flagship Bandar Setia Alam in Shah Alam, Selangor, yesterday. Sky Residences comprises four 39-storey condominium blocks, featuring a total of 844 units worth about RM800 million. It is SP Setia's first high-rise development in the Kuala Lumpur city centre, located next to the National Heart Institute on Jalan Tun Razak. On Bandar Setia Alam, Liew said the group will launch 449 units of low-cost apartments priced at RM42,000 each, and 220 units of low medium-cost apartments priced from RM72,000 to RM105,000 per unit, as part of its corporate social responsibility. The total gross development value is RM34 million. "We will be losing RM20,000 from every unit we sell but we are building the apartments to cater to the lower income group. The properties will be located next to established areas," Liew said. To help the lower income group own a home, SP Setia has teamed up with Malaysia Building Society Bhd (MBSB) to provide 100 per cent financing. SP Setia will build 7,212 affordable homes over the next 10 years. Housing and Local Government Minister Datuk Seri Kong Cho Ha, who witnessed the signing between SP Setia and MBSB yesterday, said the housing landscape should change with low-cost houses moving up a notch from a low-edge environment. Kong also urged local developers to build affordable homes close to prime areas and infrastructure to assist the low income group whom largely depends on public transportation for travel. SHAH ALAM: SP Setia Bhd targets to sell RM300mil worth of properties during the three-month extension of the 5/95 home loan package promotion from April 19 to July 19. “When we stopped 5/95 on April 19, many people still wanted to buy property but could not benefit from the promotion, so we extended it by three months,” SP Setia president and chief executive officer Tan Sri Liew Kee Sin said yesterday, adding that there would be no more extensions. It had registered RM500mil revenue during the first three months of the 5/95 financing scheme launched on Jan 19. SP Setia is also set to launch one block of Setia Sky Residences with a gross development value of about RM220mil and is waiting for one more approval from the authorities. This development is located in Jalan Tun Razak on a 5.96-acre site. It comprises four 39-storey tower blocks, with each block containing 211 condos. Liew said the company was on track to achieve RM1.1bil sales for the financial year ending Oct 31 (FY09). Contrary to media reports on the current slowing property market, Liew was optimistic on the domestic property market. He said now was a good time for development with sales worth a few billion ringgit transacted in the last three months. He said this after the launch of a low-cost housing scheme and the signing of a memorandum of understanding between SP Setia and Malaysia Building Society Bhd (MBSB) for 100% financing for low-medium cost housing in Bandar Setia Alam. Housing and Local Government Minister Datuk Seri Kong Cho Ha launched the event. 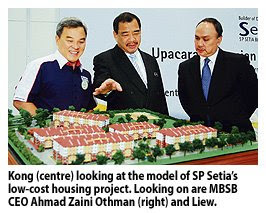 A total of 120 acres out of 2,525 acres in Setia Alam have been set aside for low-cost homes comprising 7,212 units. The low-cost scheme would be developed in phases and currently, 449 units are being offered. These comprise five- and six-storey walk-up apartments with a built-up area of 682 sq ft. The low-cost home costs RM42,000, while the low-medium cost home costs about RM72,000. Liew said that for every low-cost unit sold, the company was subsidising RM20,000. “As long as we can benefit the mass market, we will continue with this effort,” he said. KUALA LUMPUR: YNH Property Bhd posted a net profit of RM15.17 million in its first quarter ended March 31, 2009, down 43% from the RM26.69 million recorded in 1Q08. Revenue fell 29% to RM62.93 million from RM88.73 million. The lower profit and revenue were mainly due to fewer property launches in view of the weak market demand for high-end properties, the company said in a statement today. However, going forward, the group had entered into joint ventures to develop a few pieces of strategic land in Mont' Kiara, Hartamas, Kuala Lumpur city centre, Ipoh city and Seri Manjung town. These developments, which are at the planning stage, had an estimated gross development value of RM1.8 billion and were expected to contribute to the group's earnings for the next 15 years, YNH said. BINA Goodyear Bhd (BGB) said its wholly owned subsidiary, Greater Heights Development Sdn Bhd, is proposing to dispose of a piece of land to Green Heights Development Sdn Bhd for RM27 million cash. BGB said in a filing to Bursa Malaysia that the proposed disposal involved the disposal of a piece of freehold land in Mukim Bandar Sri Damansara, Selangor. Proceeds from the sale has been mainly earmarked for the repayment of bank borrowings and working capital of the group, it said. PETALING JAYA: Ahmad Zaki Saudi Arabia Co Ltd (AZSA), a wholly-owned subsidiary of local construction company Ahmad Zaki Resources Bhd (AZRB), had on May 12 accepted works order worth RM185mil from Saudi Oger Ltd of Saudi Arabia to build reinforced concrete structures for Tower H1-A of the Jabal Omar Development in Mecca. In a filing to Bursa Malaysia yesterday, AZRB said the works were expected to be completed in 18 months from the acceptance of the order. AZRB said the contract was expected to contribute positively to the group’s earnings and net tangible assets for the financial year ending Dec 31, 2009 and the following financial year. The directors were of the opinion that the works were in the best interest of the company and that it would not have any effect on the issued and paid-up capital of AZRB. KUALA LUMPUR: Domestic steel demand is projected to contract a further 25% this year, after falling 10.7% to 7.8 million tonnes in 2008, according to the Malaysian Iron & Steel Industry Federation (MISIF). Its president, Chow Chong Long, said consumption was expected to post a “recovery” in 2010 but “it would probably take a few years” for demand to be able to re-test its peak volume of 8.7 million tonnes achieved in 2007. “We are probably at the bottom, or at least near the bottom, in terms of demand and prices,” he told a press conference after the opening ceremony of South East Asia Iron and Steel Institute’s conference and exhibition 2009. Steel bar price in the domestic market had plunged from a high of RM3,800 per tonne in July 2008 to around RM2,000 per tonne in recent weeks. Chow said prices might creep up higher in the coming months, as new orders from the construction sector gained traction. “We expect demand to stabilise in the second half of the year, as domestic construction activities go into full swing, boosted by the implementation of projects under the two economic stimulus packages,” Chow said. Reflecting the trend in the global market, local steel consumption plunged more than 50% in the last quarter of 2008 and continued to be depressed during the first three months of this year. Chow said while domestic demand was showing early signs of a rebound, the sharp drop in the early part of the year would weigh down on the country’s full-year consumption forecast. The huge decline in domestic steel consumption projected by MISIF this year is also much lower than the 14.9% drop prediction in global consumption forecast by the World Steel Association. The sharp contraction may have forced local steel millers, including Ann Joo Bhd and Perwaja Holdings Bhd, to delay their production capacity expansion and factory upgrade plans this year. Currently, local steel millers are mainly skewed towards producing construction steel. While Malaysia’s production capacity in terms of tonnage “exceeds” total usage, the country still imports the bulk of its steel requirement. Government figures showed total iron and steel products exports amounted to RM10.5bil in 2008, while imports stood at RM28.7bil.